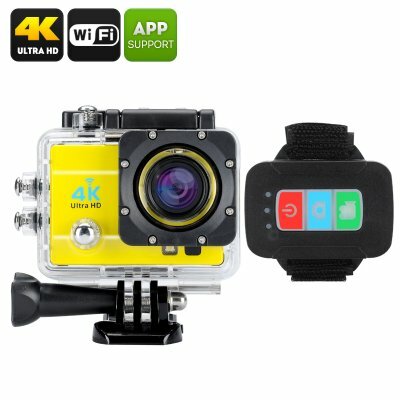 Successfully Added Q3H Waterproof 4K Sports Camera - Wi-Fi, 16MP, 170 Degree Wide Angle, 4X Digital Zoom, 2 Inch LCS Screen (Yellow) to your Shopping Cart. Take stunning pics and record great footage with the 4K waterproof action cam – the Q3H. Boasting 4K resolution, 16MP, 170 degree wide angle lens and 4X zoom, it’s a great gadget for recording your outdoor adventures! Another cool feature is the wrist remote control that allows you to trigger the cam remotely. It's super convenient when you are into action sports and need to mount your camera in hard-to-reach places. The action cam comes with a 900mAh battery – good for up to 1.5 hours of usage and is quick to recharge. The Q3H comes with a waterproof case and can be submerged for up to 30 metres. The Q3H Waterproof 4K Sports Camera comes with a 12 months warranty, brought to you by the leader in electronic devices as well as wholesale action cameras.. This item is a good little product, we have sold quite a few of these.....Thanks ChinaVasion.